It’s been a long road. Beginning in the halls of one of the world’s best companies, and spreading to the most distant corners of the world, the “#besomebody” mantra has touched many lives. A journey that started so small and simple soon became a spark that ignited the passion of people from all types of places and from all kinds of backgrounds. We’ve grown from Twitter-based hashtag, to personal blog, to social media community, to content-driven movement, to experience-based marketplace, to – today – an end-to-end solution for great companies to find great people and do great work. In between, we’ve experienced the highest of highs and the lowest lows. And we are grateful for all of it. It’s the combination of lessons and learning that have led us to where we are today. And it’s the recipe of experience and mentorship and travel and culture, that has equipped us with the skills and the awareness to develop a new model to solve some old problems: help people get jobs they love; help companies grow the right way; and help bring communities together through shared passions and values. No matter what form it’s taken, that’s really what we’ve always been working to do. So, as we push forward with our unboxable business model of skills training, job placement, and employer services, we never lose sight of where we came from, what we went through, and why we do what we do. Besomebody Founder and CEO, Kash Shaikh, shares an inspiring story of the company’s journey from its humble beginnings in 2011, through the ups and downs of growth, setbacks, and comebacks that led us to our winning business model. At Besomebody, our mission is to help build the world’s best companies. Passion. Honesty. Urgency. Awareness. Ownership. Diversity. Transparency. Service. Greatness. Gratefulness. We have three simple principles that guide our work at Besomebody. They are our commitment to our candidates, our clients, and each other. Everybody knows about IQ. And many of us know about EQ. At Besomebody, we care most about MO. We are building a lean team of expert all-stars who live and breathe our culture. And we wouldn’t want it any other way. The #besomebody concept and mantra began to come to life in 2009, and was formalized on January 11, 2011. Since then, it’s been an inspiring, humbling, and amazing ride. Founder, Kash Shaikh, comes up with the #besomebody concept while leading Social Marketing for Developing Countries at Procter & Gamble in Cincinnati, OH. Kash was traveling internationally 80% of the time, visiting 45 countries during this assignment, including some of the poorest countries in the world. After a year of sharing “#besomebody” on Twitter, Kash tweets a line that becomes the foundation of the community, proclaiming how he realized that #besomebody “is a lifestyle, not a destination.” That line becomes our ethos when we became a company years later. Kash and his brother Rick launch the #besomebody blog, a simple, black and white WordPress blog in which Kash shares personal writings and inspiring stories from his travels around the world. Kash’s first post is called “The Besomebody Lifestyle.” Later it becomes the company manifesto. The Besomebody Lifestyle has been shared tens of thousands of times by people across the world. Kash writes “A Conversation with Love.” This is the first truly viral #besomebody content. Besomebody’s Facebook page reaches 5,000 fans. Kash leaves Procter & Gamble and moves to San Francisco to lead Social Marketing and Communications for GoPro. At the time, GoPro was a little known camera company based out of Half Moon Bay, CA. Within one year – powered by their social media and great content – GoPro would become the fastest growing camera company in the world. Rick designs the first set of #besomebody “becards” – motivational copy written by Kash, on top of cool images created by Rick. This becomes the second piece of viral #besomebody content, and the #becard concept becomes a mainstay for motivation on social media. Besomebody #becards have now reached more than 100 million people across the world (Check out this week’s cards). Kash resigns from GoPro to pursue his purpose and follow his passion – to build #besomebody into the most inspirational platform in the world. He cashes out his P&G 401K, moves out of his San Francisco condo and sells all his furniture to fund the journey. Rick joins him fulltime in this pursuit as the first official employee of Besomebody, LLC. They start their company near family in Austin, TX. The first Besomebody ‘office’ is a 600sq ft apartment in Pflugerville, TX. Kash and Rick build three 8ftx4ft homemade whiteboards as the only office furniture. The first sentence Kash wrote on the boards was “I can do anything, anything is possible.” They never erased that sentence... Years later, those boards remain an integral part of Besomebody culture, traveling from office to office, and city to city. Kash leads a small team of #besomebody volunteers who travel the world as part of the ‘Tagging the World’ campaign, creating inspirational street art in 15 cities in 11 countries across 4 continents, including Mexico City, New York, London, Paris, Barcelona, Casablanca, Dubai and Manila. This becomes the 3rd big viral campaign for #besomebody. Besomebody’s Facebook page reaches 100,000 fans. We meet “Michael Jackson” - an inspiring eight-year-old boy - in the middle of Shirati, Tanzania. Michael inspires the concept for the initial #besomebody app – a marketplace in which anyone can learn anything they are passionate about by booking experiences with people around them. Kash later will pitch this concept to venture capitalists, raise money, build, launch and monetize this app. Michael Jackson remains a key part of the story throughout. Kash and Rick are joined by three college students on a nationwide college tour, in which they rent a 42-foot long RV, wrap it in “#besomebody”, and travel 15,000 miles across the country to deliver motivational talks at 25 universities for no charge. Colleges visited included the University of Texas, University of Georgia, Rutgers, Yale, University of Cincinnati, University of Arizona, University of Nebraska and the University of North Dakota. Content from these talks and the tour spreads quickly on social media, and then high schools begin asking the team to come speak. 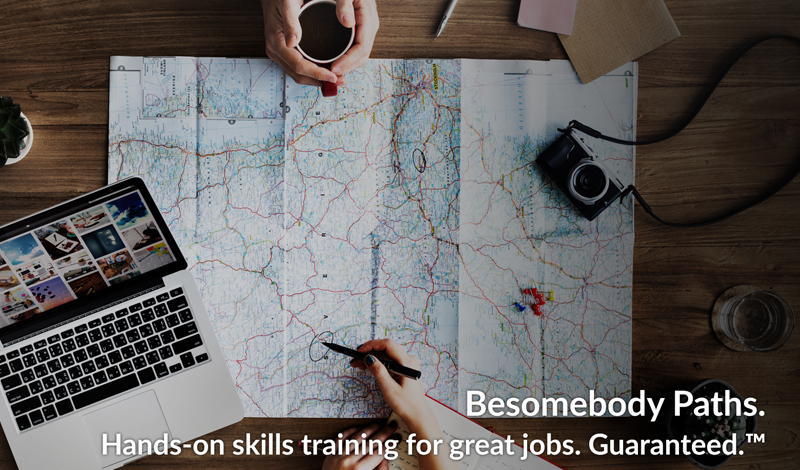 Besomebody extends the tour by two weeks in order to add underprivileged high schools to their route. Olympic Gold Medalist (and current UFC Fighter), Henry Cejudo, hears about their mission and joins for the last two weeks of the tour. During this time Kash and the team really begin to learn about the struggles facing students across the country – primarily the disregard for passion-centered curriculum, the lack of experiential learning and the crushing effects of student debt. We run out of money due to a myriad of issues and mishaps on the college tour, including the RV company stealing $30,000 of Besomebody funds from their credit card. It’s a complex scheme/scam that costs too much money to fight in court, so the team does not get the money back. Kash sends a request to all Besomebody volunteers asking if any would like to join the team “full-time” for 3-6 months while he looks to raise outside capital. Five people come onboard, and Kash and Rick’s Mom and Dad continue to volunteer their time to help. The company raises $1M from E.W. Scripps, a media and content company and venture firm based in Cincinnati, OH. He runs into Adam Symson, the Chief Digital Officer at the time, at a Starbucks across from the hotel he was staying while in town for other meetings. It was about 10am. Kash pitches the #besomebody app concept to Adam during their 10 minute walk from the coffee shop to center of town. Adam invites Kash to pitch his concept to Scripps CEO, Rich Boehm, at 2pm. Kash pitches Rich, using a 10-slide PowerPoint deck and no product demo or app prototype (he didn’t have the funds to develop it yet). Rich loves the concept and the passion Kash has for it. A few weeks later, Scripps becomes the first institutional investor in the new company – Besomebody, Inc.
Rick and Kash open up the first “official” #besomebody office, on Springdale road in Austin, TX. They invite the artists from the Tagging the World Tour to come paint the walls.They buy used furniture, build IKEA tables and they move everything in together. This office becomes home to an amazing year of events, memories and connections, and always holds a special place in their hearts. The company expands to 14 full-time employees. The majority of the team has little to no work experience, however they were early ambassadors and volunteers for the Besomebody Movement. Kash and Rick keep their promise and bring them all onboard. The original #besomebody iOS app officially launches in the App Store. From powerpoint to first paying user - booking a painting experience – in 6 months. The Besomebody iOS receives tons of critical acclaim and press coverage, including being recognized by leading publications like USA Today, Entrepreneur, Venture Beat and Tech Crunch. It was named “One of the apps that may takeover Facebook” and called “life changing” by a top Austin publication. The company raises another $1M, led by Austin construction entrepreneur, Fred Tillman, and moves into a newly constructed complex in Lakeway, TX. This 10,000 square foot playground has everything from a crossfit gym and yoga studio, to a full kitchen, basketball court and motocross track! Tillman builds it all as part of his belief and passion for the #besomebody mission. "Love" - a beautiful American Bully gifted to Kash by longtime Besomebody Ambassador, Blandon Schafer - joins the family as the official Besomebody Mascot. Soccer legends and former US Women's National Team heroes, Mia Hamm, Kristine Lilly and Tisha Venturini join the #besomebody family, endorsing the app, brand and platform, and integrating it into their TeamFirst soccer camps across the country. Each are two-time olympic gold medalists and two-time World Cup Champions. The company’s CTO resigns to take a higher-paying position at a big local corporation. A big investor bounces his check. App growth begins to slow down, and the trajectory begins to change from a true learning platform to a ‘just for fun’ platform. This marks the lowest point in Besomebody’s brief life as a startup company. Kash fights hard to keep the focus on experiential learning and skills training though many people don’t share his vision. We announce our surprise move to Boston, MA, in order to further pursue our aspirations of building a learning platform. Kash spends 9 months learning from industry and educational experts at some of the most prestigious universities in the world, including Harvard, MIT , Tufts and the Ben Franklin Institute. During this time, Kash shares his strategy and plans for Besomebody Paths with investors and team members, and makes the decision to pivot the company to focus on building them. After randomly pitching at an open casting call in New York City, Kash is selected - and fast-tracked – to appear on the hit Reality TV Series, “Shark Tank.” This is an exciting time as Kash and the team spends time in Hollywood meeting with producers, directors and ‘the sharks.’ The company decides getting ‘a deal’ from the Sharks wouldn’t be financially prudent for current investors – they offer very poor terms! – so instead focuses on putting on a memorable performance to drive TV ratings and social media chatter. The producers love the approach, and share ideas to add ‘more drama.’ Kash shares both the “old” experience app as well as his vision to build the new Besomebody Paths during a 90-minute taping, however the Paths don’t make the cut in the 8-minute TV segment. Besomebody, as expected, gets no deal, however the episode becomes one of the most watched in Shark Tank history when it airs in November 2015. The website traffic surges by 1000%. Mark Cuban tells Kash to “go be somebody bro” in an epic zinger to end the show. We release our first "MVP" video - a motivational montage of inspiring video clips brought to life with Kash's voiceover called "Stop Asking for Easy." The goal is to get 1 million views within 6 months. The video reaches 1 million views in two weeks. By May 2017, it reaches 30 million views. The team begins its first meetings with top employers to pitch the new Besomebody Paths. Every company is interested in the concept, as they share their need for skilled workers and their challenges with recruiting, training and retention. Kroger, the world’s 17th largest company and the largest supermarket in the U.S., is most excited about the potential. We align on 6 core industries in which we will pursue our initial Besomebody Paths – Healthcare, Wellness, Hospitality, Animal Care, Environment and Automotive. All these industries are growing fast, have thousands of job openings, and have a huge need for skilled talent. The company downsizes to only 4 fulltime employees. This occurs both to reduce costs, as well as because some team members decide no longer to continue the journey as we move full force toward Besomebody Paths. The lean team produces great results. The core Besomebody team relocates to Cincinnati, OH to lead the launch of the company’s biggest Path pilot, with Kroger. The pilot is for a new role called Nutrition Technician. The new Besomebody website launches, marking nearly 12 months of work to fully transition the company to focus on Besomebody Paths. Our mission is to make education and employment more accessible, practical and passion-based, and we believe we can do that through hands-on skills training and great employer partnerships. We also announce the scheduled launch of a 2nd path in Cincinnati, OH, for Dental Assistants. Both pilots are small, but are being built with scale in mind. Our goal is to take 10 people who were previously unemployed or underemployed and get them full-time jobs –through our Path training – with two great companies. The two pilots are scheduled to begin in May.